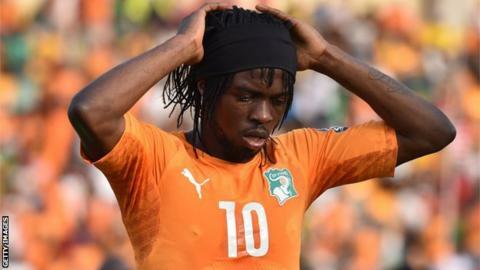 Ivory Coast forward Gervinho has been given a two-match ban following his sending off against Guinea in the sides' 1-1 draw on Tuesday. "I want to apologise to the Ivory Coast nation, my team-mates, the fans and the African Nations Cup organisers for this gesture of anger," he wrote on Twitter. "It is not like me and it does not have its place on a football pitch." Gervinho, 27, will now be unavailable for the Ivory Coast's up-coming games against Mali and Cameroon and will only feature again in the tournament if his side reaches the quarter-finals. The former Arsenal forward appeared to slap Guinea defender Keita in the 58th minute of the match in Malabo in an off-the-ball incident. Ivory Coast were a goal down at the time but fought back to earn a draw despite their numerical disadvantage.